Apologies for the lack of posting over the last couple of days, I’ve come down with tonsillitis so I’ve been feeling really rotten. Slowly getting better and back to blogging. Thanks for your patience and bearing with me. After a brief haitus, the fabulous Sample Hunters sale is back! Mark the dates in your calendar, it’s on from Thursday 1st March until Sunday 4th at The Old Truman Brewery, Shop 14, Hanbury Street, London. As usual, they will have up to 90% off the likes of Belstaff, Vivienne Westwood, Aquascutum, Oliver Spencer, Missoni, Ferragamo, Lanvin, Jimmy Choo and many more. 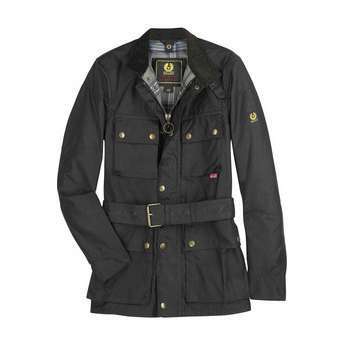 The Belstaff Roadmaster jacket (below) from their 2012 collection is only £350. Clemence Poesy stars in G-Star’s SS12 campaign. The absolutely stunning and impossibly chic Clemence Poesey stars in denim brand G-Star;s SS12 campaign, shot my Anton Corbijn. Yoyoi Kusama exhibits at Louis Vuitton on Bond Street. Louis Vuitton are supporting the Yayoi Kusama exhibition at the Tate Modern and also have a display in the Bond Street Maison. Kusama is Japan’s most revered contemporary artist, working internationally for almost 50 years.